Rachel Schaefer’s inquiry focuses on the ways classroom materials influence learning and their role in investigations. Much of what we know about how children construct knowledge and understanding through the use of materials comes from the theories of Piaget and Vygotsky and the work of academic researchers. Here we have a teacher who uses methods of inquiry common to classroom teaching (e.g., conversations with other teachers, observations of children interacting with materials, opportunities for written and verbal reflection) and who involves a group of student teachers to study questions of meaning and to help her think through her research process. Rachel demonstrates how one goes about asking questions, hypothesizing, reflecting, gathering and analyzing data, and using what has been learned to think about her teaching and children’s learning in new ways. The addition of the parallel voice of Rachel’s mentor, Kay Cutler, to provide a commentary on Rachel’s learning, adds a critical and insightful perspective on the value of teacher research. While considering teacher research topics, I became interested in project-based learning, an approach that emphasizes children’s active participation as they investigate and study real-world questions and challenges. As I focused my research and worked with my early childhood education professors, I developed a definition that I, as an educator, felt described what an investigation entailed: An investigation is an inquiry that takes place over an unspecified amount of time, in which children and teachers act as protagonists in their learning to make discoveries of their own wonderings. After reflecting with my professors, I chose to concentrate my research specifically on materials and their role in investigations. I formed my research question: In what ways do classroom materials influence learning? I hypothesized that as children manipulated the materials, becoming familiar with them through experimentation, they would participate in a deeper investigation. Using teacher research, I studied how different classroom materials influence learning. Sobel (2005), Smith (2002), and others, when describing placebased or science education, use the term investigations when real-world problem solving in the community occurs as the world becomes the classroom. Siry, Ziegler, and Max (2012) use the term investigations when describing young children’s explorations of science-based inquiry experiences. The inquiry process offers a multitude of benefits to children as they engage in their own exploration and take ownership of their learning. Children develop their own questions, make predictions about possible hypotheses, examine ways to test their theories, find ways to represent their findings, and solve problems through trial and error (Clark 2006). 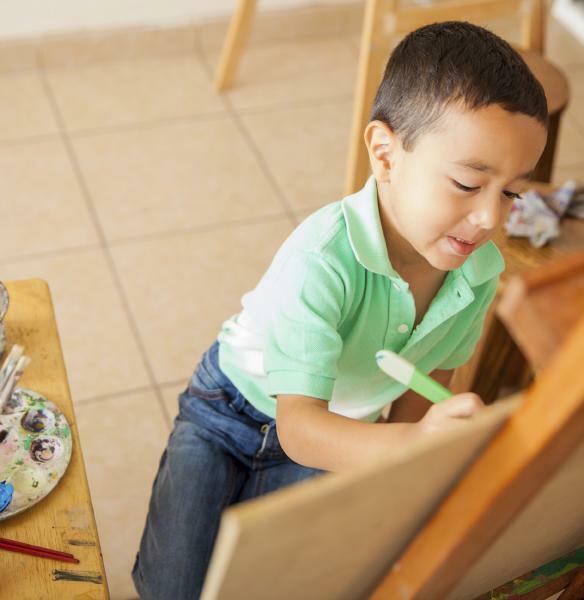 Schools following the Reggio Emilia approach rely on a type of investigation as well. They describe progettazione as a more global, flexible approach in which initial hypotheses are made by children about classroom work but are modified or have directional change as the investigation progresses, incorporating the “otherness” of those engaged in the work (Rinaldi 2006). Frequently, small groups of children work together to study, discuss, explore, and hypothesize about a topic (Project Zero & Reggio Children 2001). Projects, as Helm and Katz (2010) call them, have been said to be the backbone of children’s and teachers’ learning experiences as they follow the inquiry learning process. Projects can take on many different forms, whether a day spent investigating bugs on the playground or a yearlong study of a tree changing through the seasons. Piaget (2000) proposed that children learn by actively constructing their own knowledge and creating their own theories. Children learn best when they are creating their own understanding of how things work. A child comes to know something by physically or mentally acting on it (Piaget, Henriques, & Ascher 1992). Projects, investigations, and a more encompassing term, inquiry-based learning, provide the opportunity for these meaningful, hands-on experiences to occur. During inquiry-based learning, children apply their current understandings to new encounters in their environment. If their previous knowledge allows them to fully understand the event, new understandings emerge and the children progress to a more advanced cognitive level (Duckworth 2006). Vygotsky stressed the importance of the internal process—that is, the thinking or internal dialogue that assists children in solving a conflict or creating an object rather than the actual solution or creation of an object itself (Wertsch 1985; Fernyhough 2008). When children work together using inquiry-based learning, they share the thinking and learning that happens during the investigation (Project Zero & Reggio Children 2001; Krechevsky et al. 2013). According to Vygotsky ([1930–1935] 1978), the types of materials teachers choose for children to use mediate children’s development of higher mental processes. In addition, how and where materials are placed in the environment influences how children can use those materials (Kozulin et al. 2003). Furthermore, experiences with materials shape the development of shared meaning between individuals, giving shared meaning to symbolic cognitive tools such as letters, numbers, or words. Open-ended materials offer meaningful ways for children to deepen their understanding of a concept, build creativity, and heighten their cognitive abilities (Daly & Beloglovsky 2015). When children use different materials (clay, wire, etc.) to explore the same concept, they learn more about the concept because of the affordances that each medium possesses. Foreman (1994) defines affordances as “the relationship between the transformable properties of a medium and the child’s desire to use that property to make symbols” (4). Some mediums are better than others when representing a concept, because of both the child’s ability to manipulate the medium and the medium’s potential to symbolize the concept. The hundred languages concept, which originated in the early care and education systems in Reggio Emilia, Italy, takes the idea of affordances a step further in its assessment that the set of affordances a material has to offer “has the ability to take on expressive aspects and meaning comparable to a verbal language… [which is] foundational to the pedagogy of Reggio Emilia” (Schwall 2015a, 49). Materials can become inventive languages only as children develop relationships with the materials—relationships that develop over an extended period of time (Schwall 2015b) when the materials are intentionally placed in the environment. Once children have developed a relationship with materials over time, they find new ways of using them (Hill, Stremmel, & Fu 2005; Daly & Beloglovsky 2015; Schwall 2015a). Children experiment, investigate, and form hypotheses about the materials’ potential uses. In an inquiry-based learning environment, these hypotheses about materials’ uses can then spur children on to make creative connections about their topic of inquiry (Cadwell, Geismar Ryan, & Schwall 2015). Acting as a third teacher, the environment plays an essential role in inquiry-based learning. As explained by Reggio Emilia educators, the environment acts both as a “container” for experiences and as “content” for exploration and investigations (Abramson, Robinson, & Ankenman 1995). The relationship between materials and the environment is complex. 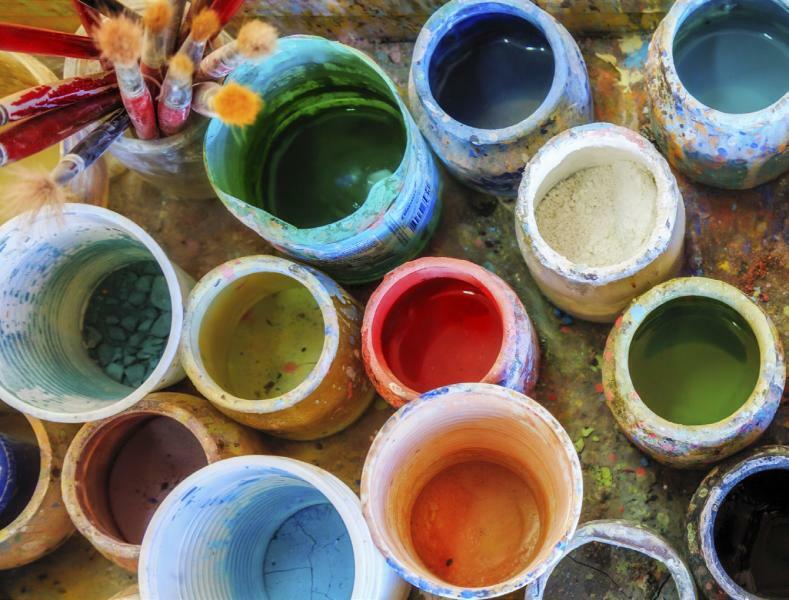 The decisions teachers make about the placement and collections of materials in a classroom or studio space influence how children perceive and use the materials (Schwall 2015). For the purpose of this study, I conducted a teacher research project over the course of three months that focused on the different ways classroom materials influence learning, as the children investigated faces and expressions. The children’s investigation originated from their interest in a teacher-directed self-portrait activity. I collected data from the afternoon classroom of 4- and 5-year-olds at a midwestern university laboratory school. There were 18 children in the class, 6 boys and 12 girls. In addition to myself as the mentor teacher, four student teachers worked in the classroom and rotated lead teaching responsibilities each week (creating lesson plans, setting out materials, etc.). Each student teacher continually observed and analyzed the influence of classroom materials on learning. The three professors I had worked with to develop my research question became an inquiry group that met with us to aid us in our analysis. Throughout the study, I met with the student teachers daily to discuss our observations. To help us think critically, the inquiry group joined us during weekly meetings to review our observations and reflections. The inquiry group also read the teachers’ daily anecdotal records, our teacher discussion records, and my own reflections and journaling. Our methods for data collection were as follows. Individual teacher reflections. Teachers journaled their observations of children’s interactions with the materials weekly. Anecdotal records. Teachers recorded children’s conversations about their experiences with the materials, discoveries they made while exploring, and conversations they had with one another while using the materials. End-of-the-day meetings. At the end of each day, teachers met to discuss the day’s events and our insights about the children’s learning and use of materials. We, along with the inquiry group, recorded and analyzed these conversations for insights into recurring themes of how children used the materials throughout the week and the impact this usage had on their investigations. Group teaching reflections. Teachers reflected during weekly meetings and dialogue with the inquiry group on the choices they made regarding materials, as well as other aspects of teaching, throughout the week. While analyzing the data, we found five common themes, or findings. The number of materials within an area affected the children’s investigation. The children’s prior experience with materials influenced how they used them. Teachers were able to influence the children’s use of materials with commentary and questions. The amount of time the materials were offered impacted children’s investigation. Integrating parts of a previous activity into a new activity helped children transition to the new method of investigating. Self-portraits. As the children used colored pencils and paper to create self-portraits while looking into handheld mirrors, we observed many children drawing basic facial features such as eyes, mouths, and hair. Most children initially used colors randomly rather than using colors to accurately represent their eye or hair color. Despite this lack of attention, children had a high interest in the self-portrait activity. We extended this provocation by encouraging the children to create faces that expressed different emotions. Collage faces—and the first finding. We replaced the materials for drawing self-portraits with magazines from which children could cut out different facial features and assemble them into faces. Our hope was that this activity would help the children pay closer attention to facial features. The materials we chose to support this activity included magazines, scissors, glue, multicultural construction paper, crayons, yarn, mirrors, and two referent images assembled by the teachers. The children took the activity in a different direction by cutting out miscellaneous objects unrelated to faces and gluing them to the paper. Some children drew faces on the paper and then added yarn to represent hair, like that on a reference image, or cut out an entire face and glued it on a piece of construction paper. The children repeatedly left the area unorganized. At this point our first finding emerged: the number of materials in an area affected the children’s investigation. We realized that if we put out too many materials, the children became overwhelmed and would not visit the area. A return to self-portraits. Next, as a teaching team, we webbed possible directions that the children’s investigation could take: we considered physical attributes and facial expressions in relation to emotions, and we considered children’s previous knowledge about each of these directions, based on our observations. As interest continued, we replaced the magazine activity with the self-portrait activity and the materials from the previous week. As we looked through the selfportraits to complete a class assessment of the children’s individual knowledge of facial features, we noticed that the majority of the drawings had basic features but not much detail (i.e., children drew circles for eyes with dots in the middle but did not include eyelashes, irises, eyebrows, etc.). We also noticed that the children didn’t use the mirrors as much as we had hoped. Smaller paintbrushes and the observation booth. As the next step in the children’s investigations, we introduced paint as a medium for self-portraits. For this activity, children used paint to draw over their reflections on an observation booth mirror that was a part of our classroom. Although children were familiar with paint as a medium, the observation booth mirror was an unfamiliar canvas. We hypothesized that because the mirror would be directly in front of the children, they would pay close attention to their own facial features (including the size) and draw the features to match their own. The student teachers and I reflected on our observations about painting on the observation booth mirrors. Teacher One: First, let’s talk about what everyone observed from yesterday. Let’s start with the painting. Teacher Two: I don’t think [the children] were really doing anything that we thought they would do ... They aren’t really doing their reflection. Maybe if we wanted them to actually trace their face, we could find a way to use colored pencils because then they could add more detail. Teacher One: I know this is something we talked about in the booth, too. The paint was so thick ... it was a lot harder for them to draw in those details. Teacher Three: But they used small brushes, which helped. Teacher Two: It still would cover half of your face with one stroke. Teacher One: I know that they didn’t use the mirrors as we hoped. And just looking at the sizes of what they were drawing was not congruent with their faces. The materials we chose to support this activity included paint, small paintbrushes, the observation booth window, smocks, garbage bags, and hollow blocks for children to use as a platform to stand on. We limited the amount of paint because we did not want the children to become overwhelmed. We chose multicultural colors and yellow and blue so the children could mix colors. As we observed, we noticed that although the children could see themselves in the mirror, many did not paint themselves to scale. We wondered whether the paintbrushes and paint made it more difficult for children to draw details than the colored pencils and crayons they had been using for previous activities. The children included facial attributes, but they did not choose colors to match their features. Many children appeared hesitant to paint on the mirrors. We wondered what would happen if we left the activity out all week. Light table. At the same time the children were painting, a light table was also available. We had taken photos of the children and enlarged them so that they could explore their eyes, noses, and mouths, using markers to trace around and color in their features. When observing the light table, I saw few children visiting. At the time, the light table was up high, sitting on top of another table, because its legs were broken, making it difficult to access. One child really struggled to reach the materials but still managed to trace around the eyes of her photo carefully. When she finished tracing, she scribbled in the rest of the eye. I wondered whether this was because she became frustrated or whether her intention was to color the eye’s iris. We agreed it was important to make the light table more accessible and discussed using colored pencils instead of markers because colored pencils allowed for more detail. Clay—and two more findings. 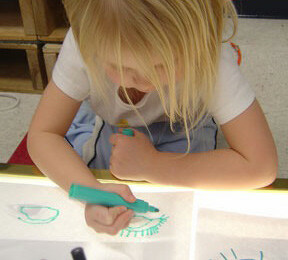 During the first weeks of preschool, the art area had clay for the children to explore. The clay was hard and not easy to manipulate, so we had children add water to the clay to soften it. When we reintroduced more malleable clay during the investigation, we noticed the children still wanted to add water to it, despite the fact that it was softer and easier to manipulate. Upon evaluating this observation, our inquiry group noticed the second finding: children’s previous experience with the materials influenced how they used the various media. To further our research on how children were using the clay, we felt it would be necessary to post teachers in the area, dialoguing with the children about the processes of creating a selfportrait, expressions, and facial features. The next day, after asking children to join me in the clay area, I sat down and began talking about flattening my clay so I could “draw” on it. The children in the area with me asked if they could use a rolling pin to flatten their pieces. One girl sitting at the table with me began to draw the same face I was drawing. We discussed the shape of noses and how to draw them. She added nostrils, something I had not added. Another girl created a silly face out of her flat piece of clay. She told me it was silly because of the way she had made the mouth (which was a straight line). From past experiences with her, I knew that when she made a silly face, she would put two fingers on each side of her mouth and pull, causing her mouth to go straight. Following this scaffolding experience, our inquiry group continued to dialogue about our processes, which led to our third research finding: teachers can influence how children use materials through commentary and questioning (a form of scaffolding) while children use materials. While the teachers and I were discussing our observations and reflections with the inquiry group, a fourth finding soon emerged: when integrating a new activity in the children’s investigation, purposefully pairing parts of the “old” activity with the “new” activity scaffolded the children’s confidence in exploring the new activity. For example, we would consistently use paint but change what the children would use as a canvas. A fifth finding that emerged was that the amount of time the materials were in an area impacted the children’s investigation. When the children explored the same materials for a long time, their representations became more detailed. 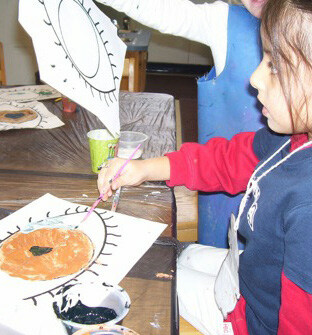 We had tempera paint and an eye template in the art area for several weeks. As the children used the materials daily, they gradually added more details to their eyes, such as eyelashes. The children also began to mix paint independently to match their actual eye color. As the semester ended, we were curious to know what would happen if we asked the children to draw a picture of a friend. As a culminating event, we paired each child with a friend and asked them to draw one another. We provided familiar materials—colored pencils and paper. As the children drew their friends, we found that the children were very particular about how they were drawn. One girl said to another, “You don’t have the right colors,” referring to her hair. A boy said to his partner, “You need ears. See, I have ears.” Many children paid attention to specific details such as the size of the mouth (“I’m only making it this big because her lips are small.”). The children also began making comparisons to one another, saying things such as, “Rebekah has longer hair than I do. My hair is about to my shoulder.” The children paid attention to the colors they chose, using yellow to represent blonde hair and blue to represent the color of the iris. There are limitations to this study. The study was conducted over a short amount of time (approximately three months). Because the study was completed in a laboratory setting, some student teachers may have been too immersed in learning the basics of teaching to be able to focus energy into the depth of this study. This was the first experience with a teacher research project for most of the student teachers. Forming a question about the influence materials have on learning led to meaningful teacher research that changed the way I teach today. I am now a kindergarten teacher, and when I introduce new materials to my classroom, I give children time to explore and build relationships with the mate of materials evolves along with children’s learning. My teacher research shaped this perspective. Although I was able to find answers to my original question, I have developed more questions as a result of conducting my teacher research. I now wonder which of these themes had the greatest impact on children’s investigation. I also wonder how the different themes influenced one another. For example, did the questions teachers asked children influence the way the children used the materials more than having materials available for a prolonged period of time? Moreover, what would have happened if we had allowed the children to take more of a role in choosing materials? Would they have visited an area more because they were part of the decision making? Last, what other media could have been introduced? We focused primarily on materials for drawing and painting. While children became familiar with the affordances of these materials, what would they have done if we introduced them to something like wire? How much time would they have needed to become familiar with its affordances? What would be a sufficient amount of time for children to explore it? Is there such a timeframe? How do the children let you know that they are completely comfortable with a new medium? While I continue to ask questions and reflect, I realize the importance of my study and the significance it can have on other early childhood educators and myself in future teaching endeavors. I understand the role that materials play in curriculum development and investigations. This newfound knowledge, as a result of my teacher research, is something I will carry with me for the rest of my teaching career. The process of teacher research has greatly enhanced my abilities as a teacher and continues to significantly impact my daily teaching practices. Abramson, S., R. Robinson, & K. Ankenman. 1995. “Project Work With Diverse Students: Adapting Curriculum Based on the Reggio Emilia Approach.” Childhood Education 71 (4): 197–202. Cadwell, L., L. Geismar Ryan, & C. Schwall. 2015. “The Atelier: A System of Physical and Conceptual Spaces.” Chap. 10 in In the Spirit of the Studio: Learning From the Atelier of Reggio Emilia, 2nd ed., eds. L. Gandini, L. Hill, L. Cadwell, & C. Schwall, 111–34. New York: Teachers College Press. Clark, A. 2006. “Changing Classroom Practice to Include the Project Approach.” Early Childhood Research and Practice 8 (2). http://ecrp.uiuc.edu/v8n2/clark.html. Daly, L., & M. Beloglovsky. 2015. Loose Parts: Inspiring Play in Young Children. St. Paul, MN: Redleaf. Duckworth, E. 2006. The Having of Wonderful Ideas: And Other Essays on Teaching and Learning. 3rd ed. New York: Teachers College Press. Fernyhough, C. 2008. “Getting Vygotskian About Theory of Mind: Mediation, Dialogue, and the Development of Social Understanding.” Developmental Review 28 (2): 225–62. Foreman, G. 1994. “Different Media, Different Languages.” Paper presented at the Study Seminar on the Experience of the Municipal Infant–Toddler Centers and Preprimary Schools of Reggio Emilia in Reggio Emilia, Italy. ERIC, ED375932. Helm, J.H., & L. Katz. 2010. “Projects and Young Children.” Chap. 1 in Young Investigators: The Project Approach in the Early Years, 2nd ed., 1–11. New York: Teachers College Press. Hill, L.T., A.J. Stremmel, & V.R. Fu. 2005. Teaching as Inquiry: Rethinking Curriculum in Early Childhood Education. New York: Pearson Education. Kozulin, A., B. Gindis, V.S. Ageyev, & S.M. Miller. 2003. Vygotsky’s Educational Theory in Cultural Context. New York: Cambridge University Press. Krechevsky, M., B. Mardell, M. Rivard, & D. Wilson. 2013. Visible Learners: Promoting Reggio-Inspired Approaches in All Schools. San Francisco: Jossey-Bass. Piaget, J., G. Henriques, & E. Ascher. 1992. Morphisms and Categories: Comparing and Transforming. Trans. T. Brown. Hillsdale, NJ: Erlbaum. Project Zero & Reggio Children 2001. Making Learning Visible: Children as Individual and Group Learners. Reggio Emilia, Italy: Reggio Children. Rinalldi, C. 2006. In Dialogue With Reggio Emilia: Listening, Researching, and Learning. New York: Routledge. Schwall, C. 2015a. “The Grammar of Materials.” Chap. 6 in In the Spirit of the Studio: Learning From the Atelier of Reggio Emilia, 2nd ed., eds. L. Gandini, L. Hill, L. Cadwell, & C. Schwall, 49–62. New York: Teachers College Press. Schwall, C. 2015b. “The Atelier Environment and Materials.” Chap. 7 in In the Spirit of the Studio: Learning From the Atelier of Reggio Emilia, 2nd ed., eds. L. Gandini, L. Hill, L. Cadwell, & C. Schwall, 63–80. New York: Teachers College Press. Siry, C., G. Ziegler, & C. Max. 2012. “‘Doing Science’ Through Discourse-in-Interaction: Young Children’s Science Investigations at the Early Childhood Level.” Science Education 96 (2): 311–26. Smith, G.A. 2002. “Place-Based Education: Learning to Be Where We Are.” Phi Delta Kappan 83 (8): 584–94. Sobel, D. 2005. Place-Based Education: Connecting Classrooms and Communities. 2nd ed. Great Barrington, MA: The Orion Society. Wertsch, J.V. 1985. Vygotsky and the Social Formation of Mind. Cambridge, MA: Harvard University Press. Vygotsky, L.S. [1930–1935] 1978. “Interaction Between Learning and Development.” In Mind in Society: The Development of Higher Psychological Processes, ed. and trans. M. Cole, V. John-Steiner, S. Scribner, & E. Souberman, 79–91. Cambridge, MA: Harvard University Press. Voices of Practitioners, NAEYC’s online journal, is a vehicle for publishing teacher research. Look for an upcoming special online issue of Voices honoring Gail Perry, the late Voices editor. Many thanks to Voices coeditor Barbara Henderson, executive editors Frances Rust, Andy Stremmel, and Ben Mardell, and to the Editorial Advisory Board for their continued support of Voices and teacher research. Rachel Schaefer, MS, is a kindergarten teacher with the Elkton School District in South Dakota. Past teaching experiences include three years as a mentor teacher at the Fishback Center for Early Childhood Education at South Dakota State University and two years as a full-day preschool/ junior kindergarten teacher.